Analysing your skin is essential for us to understand the makeup and health of your skin and is essential for us to be able to establish what treatments will be suitable for you and to enable us to achieve your goals. 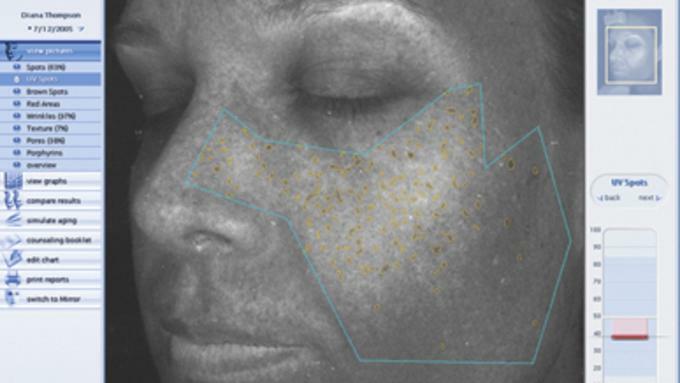 We are proud to announce that we have the very latest 3D skin analysing system available in the market. The skin and complexion analyser utilises a smart operation system making an in-depth diagnosis of your skin, fast, simple and extremely detailed. Rachel’s Beauty World will use this analysis to recommend a suitable skin rejuvenation regime for you, and skin care options. Your facial skin analysis is as unique as a fingerprint – everyone is different and therefore it is essential to understand your skin before you can decide on your means of attack. This analysis will be kept on file and further analysis will be carried out after recommended treatments, whilst in commencement or after the treatment is complete, so that you can see the results of your treatment and track your own process.